1.2 Where Can They Be Installed? Heat pump technology is a form of heating water that became popular in Adelaide around the year 2008, it was at this time the South Australian government made huge changes to the installation rules for electric hot water systems in the domestic market and rolled out the introduction of heat pumps to the plumbing industry. The actual technology which allows the heat pump to generate hot water is performed through the heat pump generating heat and transferring it through to the heat sink. The heat pump when in use will move thermal energy in an opposite direction of spontaneous heat flow by absorbing heat from a cool space and then transferring it to a warmer location. A heat pump requires the contribution of an external power source to help make the entire process possible so that is why the heat pump took place from the conventional electrical storage hot water service. The upgrading of these hot water tanks allowed for the existing electrical power feed to be connected to the heat pump for is power source, but by allowing the heat pump to operate in its intended way even with the existing electrical feed connected to the heat pump system the energy consumption was far less making these a great alternative to electrical storage hot water services. 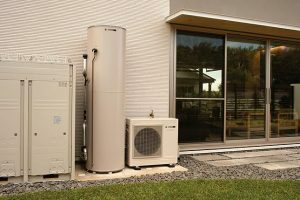 In Adelaide a manufacturer which made a large impact to the heat pump market was a company called Quantum, the chances are that if you see a heat pump installed across the state it will most likely be a Quantum system. Where Can They Be Installed? Heat pump hot water systems cannot be installed inside of houses or inside plant rooms they need to be in an external situation. The design of the heat pump hot water system comes in two different styles, one had the heat exchanger located on the top of the storage tank and the other had the component mounted on the ground at the front of the storage tank. Depending on the size and manufacturer you purchase the heat pump from will depend on the style of system you will have. In commercial arrangements heat pumps can be manifolded together to provide a large amount of hot water at one time, a great example of this is sporting clubs where they have large change rooms and require a huge amount of hot water at the end of games for the showering facilities.